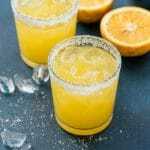 This fall twist on a classic cocktail creates a refreshing sipper great for any time, Thanksgiving included! 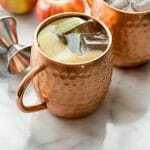 Apple Cider Moscow Mules are easy to prepare and even those who don’t love mixed cocktails will love this due to its light, crisp flavors. This post for those of legal drinking age; please always drink responsibly! This sliver of time, the weeks between Halloween and Thanksgiving, never feels to have its own stronghold on the seasonal calendar. It’s sort of a no man’s land, a waiting zone, until the Thanksgiving feast and the immediate Christmas season quickly commencing afterwards. Their claim, these three weeks, in the food realm seems to be a mere time to cram as much Thanksgiving recipe options into cyber space as possible. 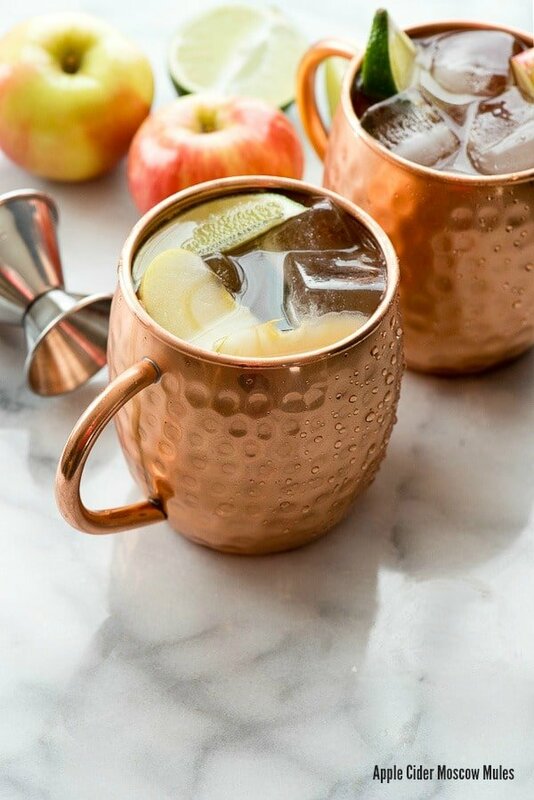 I too will be sharing ideas for Thanksgiving feasting over the next weeks but today my friends, I’m simply celebrating fall with Apple Cider Moscow Mule cocktails. Normally for Halloween I stay at home to hand out candy and glow bracelets, and my husband accompanies the kids Trick-or-Treating. It’s sort of stressful. There is a fine art to preparing a glow bracelet for a Trick-or-Treater. If you crack the stick too early the bracelets are dim by the time the doorbell rings. Wait too long and it’s like being a one-armed paper hanger to dole out lollipops and make bracelets for a group of 10 restless costumed humans anxious to get to the next house. This year I went out with the kids and it was the most beautiful night. It had been an unseasonal 80-degree day with a clear, dark night bursting with stars and all the constellations you learned about in grade school. The neighborhood was chirping with the sounds of Halloween fun. The silhouettes of goblins and princesses could be seen darting across the street to be sure not to miss a single house. The day following, I took the task of deconstructing all the spooky décor I’d put up so recently it seemed. The day was quiet with a sleepiness to it; the aftermath of a Halloween on a weeknight. All the colored leaves have been blown off the trees. The long, wild grasses in the open space across from us are a golden-tawny color as they become in fall. The light is soft and the air is still. It’s the perfect time for a refreshing fall cocktail. One that COULD be used for Thanksgiving but one just as perfect for sitting on the front steps watching the clear blue day become enveloped into dusk. Just to punctuate a moment, not worrying about how many Saturdays until Christmas (curse those people on Facebook who are circulating that meme). Moscow Mules have definitely become a favorite cocktail of mine. 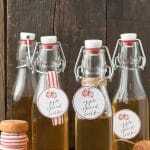 The traditional version is a combination of vodka, lime juice and ginger beer (which is non-alcoholic). 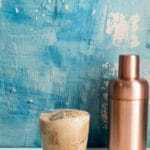 They are traditionally consumed in copper mugs which is related to an original partnership between a vodka maker, ginger beer maker and coppersmith. I created a holiday version last year, Cranberry Moscow Mules, which I drank all December. Unlike the heavy, creamy spiked Egg Nog or Hot Buttered Rums, Moscow Mules really are light and fresh-tasting making them a great seasonal bright point on the cocktail horizon. 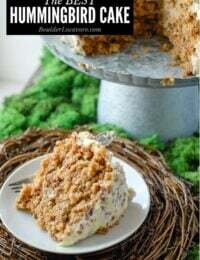 This version is actually made with hard cider which is usually gluten-free (always check if you are gluten-free), and a fresh and fizzy version of an apple drink. Combined with the traditional Moscow Mule ingredients the cocktails become a refreshing choice, and one that is not overly boozy (so those who are not so into cocktails might take a fancy to them as well). NEED A ‘MOCKTAIL’ VERSION? Substitute real apple cider for the vodka and hard cider (so 3 1/2 ounces), and make the rest the same (including the great copper mugs)! 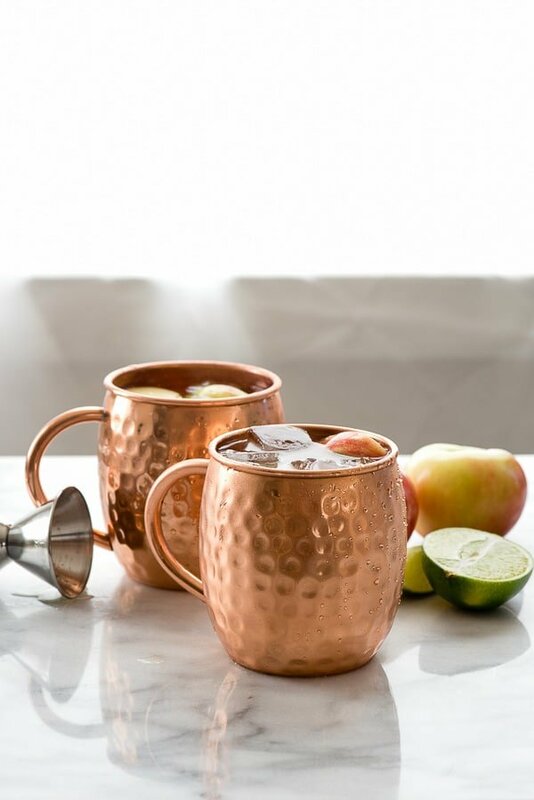 WHERE TO BUY: Copper mugs are not required for Moscow Mules but are traditional. I purchased the mugs in this post on Amazon.com. A fall twist on a classic Moscow Mule cocktail creates a refreshing, lighter sipper great for any occasion. Would be a fun cocktail for Thanksgiving too! 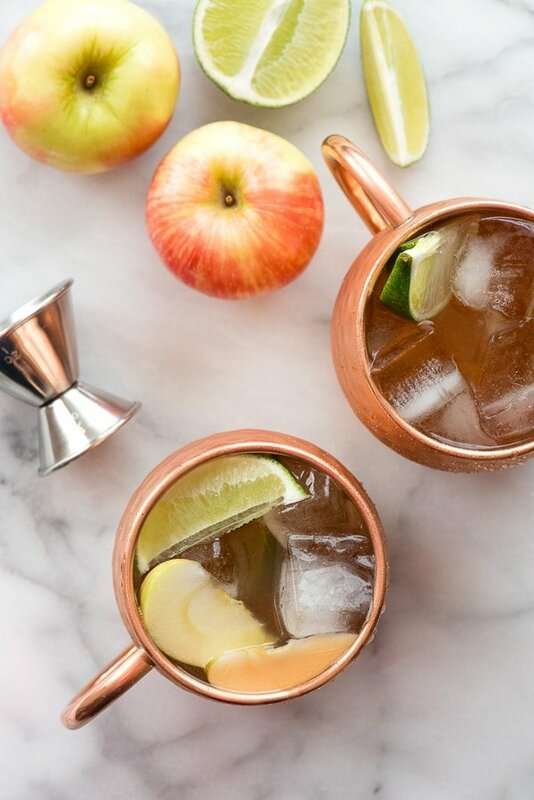 In two 16-ounce copper mugs (or equivalent) add half the vodka, hard cider and lime juice. Fill with ice and with ginger beer. Garnish with lime wedges or apple slices if desired. 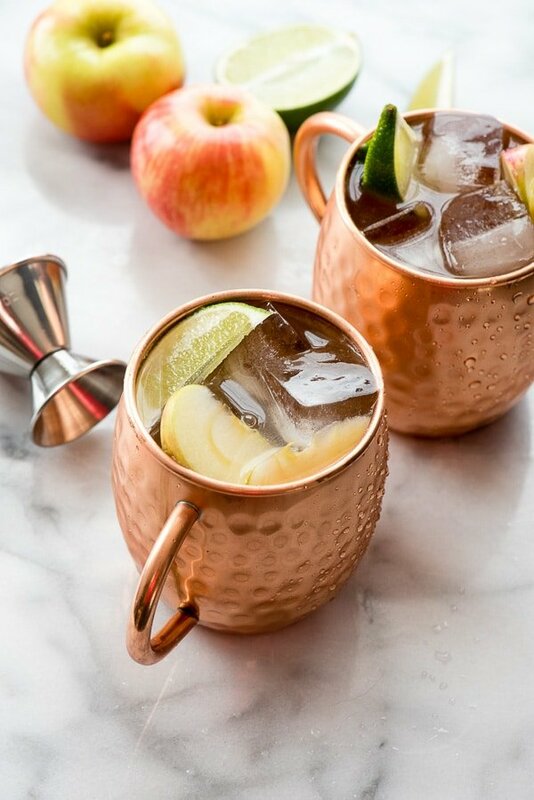 Never heard of Moscow Mules but the pic presentation looks so delicious. Great job with the pics and the mug, really makes me want to try this. A+ on presentation. This looks like such a yummy cocktail. I am going to have to give it a try. This looks like a really refreshing drink! I love that it’s easy to put together as well. The flavors are perfect for the season! Definitely a drink worth serving at parties. 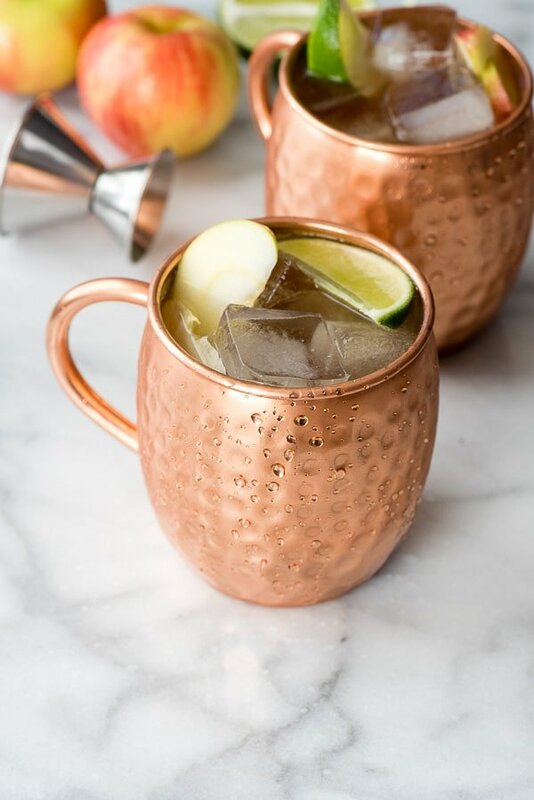 The Moscow Mule looks so delicious and easy to make. It would be a perfect drink to relax after a night of trick or treaters. I desperately need a good drink for my thanksgiving feast one that is a little out of the ordinary and this one fits the bill! Thanks so much for the recipe! 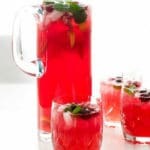 The drink looks so refreshing and would be great to enjoy with a small group of friends! Those copper mugs look so nice too. I think I will get a few of them.